Robert Michael Abla, 52, of Erick, Oklahoma was born on August 13, 1966 in Eureka, California. He is the son of Carl William and Ardis Malissa (Hill) Abla. He went to meet his Lord and Savior on Monday, January 28, 2019 in Erick, Oklahoma. He married Jenny Lee Bunch on June 17, 2016 in Erick, Oklahoma. 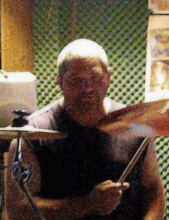 Robert loved drumming, spending time with family and teaching his family to play the drums. He enjoyed being a co-supervisor with his dad. He was a member of The Church of Jesus Christ of Latter-Day Saints in Clinton, Oklahoma. Funeral services will be held at 2:00 p.m., Friday, February 1, 2019 at the First Christian Church in Erick, Oklahoma. Jim Johnson, Dan Turner, Leonard Weaver and Lee Arnet will officiate. Interment will be at Erick Cemetery in Erick, Oklahoma. Services have been entrusted to the care of Martin-Dugger Funeral Home in Elk City, Oklahoma. Cherishing his memory is his wife, Jenny; father, Carl Abla and companion, Shirley Ely; three sons, Robert Matthew Abla and his wife, Ciera, Trevor Abla and Thomas Bunch all of Erick, Oklahoma; three daughters, Cherokee Bunch of Erick, Oklahoma and Rebecca Bunch and her husband, Dusty Jolly of Sayre, Oklahoma, Ashley Bunch and husband, Steven Cross of Erick, Oklahoma; four brothers, Bubby Abla and his wife, Darla of Elk City, Oklahoma, Wes Abla and his wife, Cindy, Corey Thomason and Rodney Abla all of California; two sisters, Brenda Arent and her husband, Lee of Yorktown, Texas and Binnie Craig and her husband, James “Skinny” of Elk City, Oklahoma; fourteen grandchildren. He is preceded in death by his mother, Ardis; one son, Levy Cayne Abla; three brothers, Butch Abla, Jeff Abla and Rocky Abla; one nephew, BJ Abla; paternal grandparents, Papo and Vergie Abla; maternal grandparents, Wesley and Thelma Hill. Memorials can be made to the American Cancer Society and the Saint Jude’s Cancer Fund in care of Martin-Dugger Funeral Home, P.O. Box 707, Elk City, Oklahoma 73648. To send flowers or a remembrance gift to the family of Robert Michael Abla, please visit our Tribute Store. "Email Address" would like to share the life celebration of Robert Michael Abla. Click on the "link" to go to share a favorite memory or leave a condolence message for the family.